Today is my little girls 11th. Birthday! She requested strawberry cupcakes in lieu of a birthday cake. She's a girl after my own heart as I would much rather decorate cupcakes than a whole cake. Off I went in search of the perfect gourmet cupcake for the sweet little light of my life! On my journey I came across these little gems. With my heart racing in anticipation of finding the perfect cupcake I glanced at the recipe and what do you know! It was super simple to boot! The strawberry cupcake Gods were listening. Heat oven to 350°F (325°F for dark or nonstick pan). Place paper baking cup in each of 12 jumbo or 24 regular-size muffin cups. In medium bowl, beat frosting ingredients with electric mixer on medium speed until smooth. Frost cupcakes. Sprinkle with shimmer silver and/or pearls. These are gorgeous and sound so yummy! Happy birthday to your adorable daughter! These are so pretty!! I love the pink frosting!! What beautiful cupcakes! Looks like you have a great decorator! 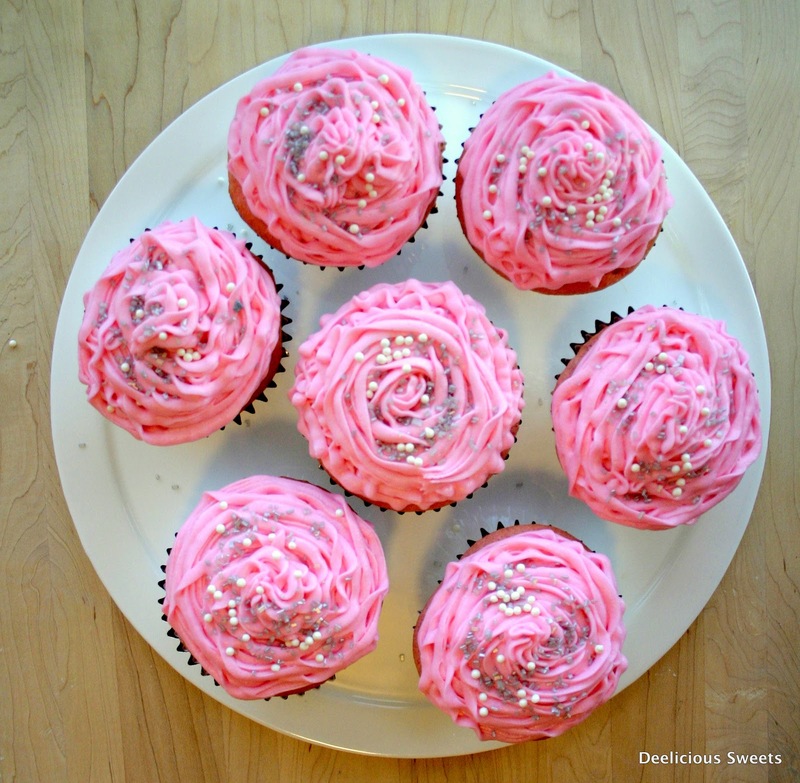 What a lovely looking cupcakes and beautiful color of the icing. How pretty! I love the idea of champagne in cupcakes. Happy Birthday to your little girl! Perfect cupcakes to celebarte a very special ocassion, what better than you beautiful girl. Wish her a very very happy birthday. And then when you're done, you get to drink the rest of the champagne! That might be the best cupcake recipe EVER!! Happy Birthday! Made these tonight...they were so delicious I can't stop thinking about them. Have to wait til tomorrow night for another! Cheers!